2015 Ford Mustang set to take over show! Over the past few years, the Ford Mustang has created quite a buzz at the SEMA Show, held every November in Las Vegas. This year is no different, as Ford Motor Company is set to rock the halls with a barrage of 2015 Mustangs. Ford has worked with top builders including Galpin Auto Sports, Petty’s Garage, MRT, Watson Racing and many others, to showcase over a dozen custom Mustangs in its 20,000-square-foot booth at Las Vegas Convention Center, Nov. 4-7, with even more new pony cars on display around the show floor. 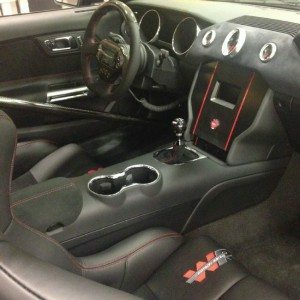 Mustang enthusiasts are excited about the all-new 2015 model, which marks a dramatic change in not only style, but also from the mechanical side, with loads of new aftermarket components. Under the Stang is an all-new independent rear suspension and new multi-link front suspension that is being tweaked by Roush, Steeda, Watson Racing and others, and we’ll see exactly what these companies are up to at SEMA and in the months to follow. Furthermore, we’ll see how the aftermarket attacks the enhanced 435-horsepower 5.0-liter Coyote V8, as well as the all-new 2.3-liter EcoBoost four-cylinder engine. Manufacturers and tuners will undoubtedly increase boost, improve airflow and kick the output well beyond 310 horsepower. While 310 horsepower and 320 lb-ft of torque, is nice in stock trim, the 2.3- liter EcoBoost has much more potential for performance. Several tuners will be on hand at SEMA with high-powered versions of the new turbo four- cylinder from Ford. As for specialty 2015 Ford Mustangs scheduled for the show, Petty’s Garage will be bringing a Mustang with a purpose—a Roush supercharged V8 model wearing Richard Petty’s famous “Petty blue” paint and a discrete No. 43. The car will be auctioned by Barrett-Jackson with proceeds benefiting Victory Junction, which is dedicated to helping chronically ill children attend summer camp. Galpin Auto Sports (GAS) is celebrating 50 years of Mustang with a golden anniversary car. Its 2015 Mustang features restyled front and rear fascia with a gold motif. “We like the black and gold idea, and really wanted to get the color as close to 24-carat gold as possible,” said Brandon Boeckmann, GAS operations manager. The 20-inch wheels, side sills, brake calipers and badging are all finished in gold. Inside, everything that is normally chrome or metallic has either been blacked-out or given the “Midas” touch. The Recaro seats are covered with a fabric finished in black and gold, and the headliner is black microsuede. The exterior is finished in paint that may appear black, but on further inspection is filled with gold metallic flecks. To top it all off, a gold powder-coated Whipple supercharger helps the 5.0-liter V8 develop 725 horsepower. Yet another hot Mustang is coming from the Watson Racing camp. “Watson Racing has created the ultimate street/strip cruiser. Just the right blend of power and safety features as well as shedding significant unnecessary weight to make it a drag strip dominator, yet is still very comfortable and street legal,” said John Phillips of Watson Racing. The racy ’15 Stang has a wicked-cool stance, a paint scheme that works for the show or strip and the power to run mid-9s. 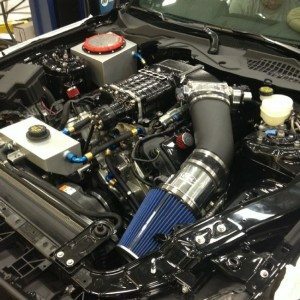 Some of the components include a Ford Racing supercharger, FR cams, FR throttle-body and mass air meter, Tremec Magnum six-speed, a Dynotech one-piece driveshaft, Centerforce clutch, Optima battery, C&R radiator and many of Watson Racing’s own pieces, such as the intercooler tank, 10-gallon fuel cell, driveshaft safety loop, lightweight K-member, and tubular bumper mounts. In addition, the 2015 Ford Mustang rides on new Weld Racing wheels and also has a customized interior to match.